The World Congress on Information Technology (WCIT), held every two years, is a gathering of top executives in the Information Technology (IT) field who meet to discuss the latest innovations in IT and how these advancements can help consumers. The conference also allows business leaders to forge connections with colleagues from around the world and speak about changes in their markets. The WCIT, which began in 1978, had previously been held in such locations as Paris, Tokyo, and London. In 1998, Fairfax joined that list of key cities in the IT realm when George Mason University hosted the 1998 World Congress. During the early 1990s, Fairfax had become a beacon for technology corporations. America Online, once a world-leading internet provider, was headquartered in Fairfax County during the early to mid-1990s, before moving to neighboring Loudoun County. Fairfax County was looking to bring global attention to the area and to further solidify its standing as a capital of the IT industry. The Fairfax Board of Supervisors budgeted $200,000 to attract such an event in 1995. Meanwhile, the WCIT was looking to find a location for its 1998 conference. Jim Poisant, the CEO of the World Congress, previously helped plan the 1992 Olympics and the 1994 World Cup, but the WCIT was a much more complex event to coordinate. In 1995, Harris Miller, the president of the World Information Technology and Services Alliance, the organization which stages the World Congress, began talks with George Newstrom. Newstrom was the chairman of Electronic Data Systems (EDS), a global IT contracting firm and a major technology employer in Northern Virginia. Newstrom was keenly aware of the push by Fairfax County, and in particular, the Fairfax Economic Development Authority, to attract an event of the magnitude of the WCIT. Miller intended to scout other locations across the United States, but timing concerns necessitated that he support a bid to award hosting privileges to Fairfax County. Lacking anything remotely resembling a convention center in which to host the conference, Fairfax leaders turned to George Mason University. President George W. Johnson was initially concerned that a college setting would give the event an inappropriate “academic appearance,” but eventually acquiesced to the pleas of officials and permitted the county to use locations on the Fairfax Campus as convention center space in their bid proposal. A delegation from Fairfax, including Harris, traveled to Seoul, South Korea in November 1995 and submitted their hosting proposal to the committee tasked with selecting a site for the 1998 WCIT. The other top contenders for hosting privileges were locations in Australia, India and Taiwan. The Fairfax delegation was asked by the committee for biographical information about George Mason, the university’s namesake. A short time later, the committee voted to award the hosting privileges to Fairfax and George Mason University, largely due to the high concentration of IT companies in Northern Virginia. After winning the bid, the Fairfax group focused on fundraising efforts. Representatives began a world-wide campaign to try to influence international technology figures to purchase tickets, at a cost of over $1,000 per person, to attend the conference. A not-for-profit organization to fund the conference was established, raising $5.8 million from the private and public sector. The federal government and Commonwealth of Virginia each contributed $1 million. Fairfax County, itself, would end up spending over $3 million to promote the conference. George Mason University would then begin to plan for what would be one of the most high- profile events ever to occur on its campus. The new president of the university, Dr. Alan G. Merten, expressed excitement that Mason would be the first university ever to host the WCIT. Former Soviet Union leader Mikhail Gorbachev, former British Prime Minister Margaret Thatcher, and publisher Steven Forbes of Forbes Magazine, were booked as keynote speakers for the event. The conference was scheduled to be held at the end of June in both the George W. Johnson Center and the Center for the Arts. The University would act as more than just rented space, as Mason faculty members were scheduled to take part in the event. The 1998 World Congress on Information Technology ran from June 21 to June 24. One of the most recognizable figures at the event was Michael Dell, the CEO and founder of Dell Computers. At the event he gave his impressions about what constituted a top-of-the-line computer. According to Dell, this computer in 1998 would have at least a 10 GB hard drive, 128 MB of RAM, and would cost around $2000. Other notable guests among the over 1,700 attendees included the President of NASDAQ, then Virginia Governor James S. Gilmore, former Virginia Governor, George F. Allen, and representatives from the Central Intelligence Agency. Government officials from all over the world attended the event, hoping to acheive lucrative contracts with technology giants. The 1998 World Conference on Information Technology exposed George Mason University to the global IT community. Many years after the conference, the University continues to embrace and creatively exploit technology. Today, Mason employs the most innovative classroom technologies to assist in its mission and partners with the world’s leading technology firms, such as CISCO Systems and others. 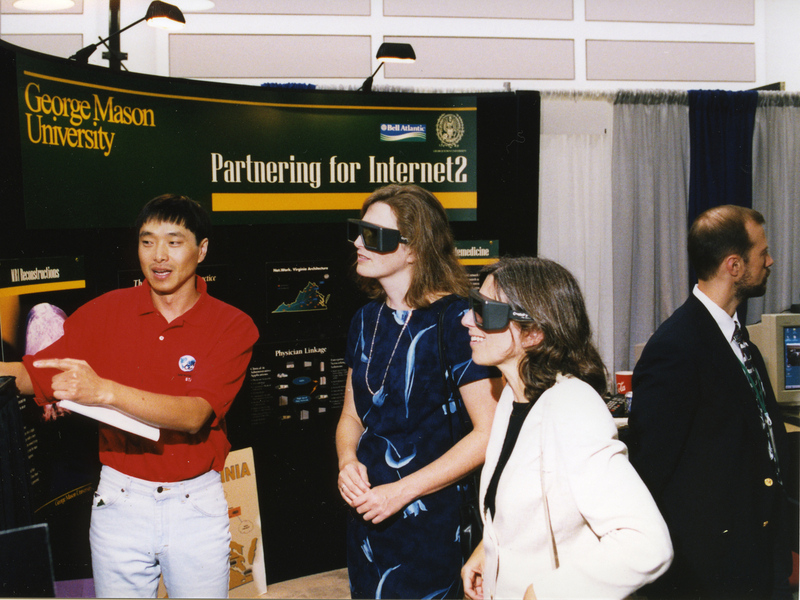 Browse items pertaining to Mason's hosting of the World Conference on Information Technology in 1998.